Acupuncture is an ancient and amazing science which is a unique invention of Chinese Medicine. By stimulating the acupoints of the body surface and using the meridians and collaterals as transmitting channels, acupuncture regulates qi and blood and the functions of zang-fu (internal) organs, thereby achieving the objective of "supporting the right and expelling the evil" and "curing diseases and preserving health". The continual development of human wisdom and social productivity is accompanied by the increasing widespread application and improvement of the therapy using acupuncture and moxibustion. 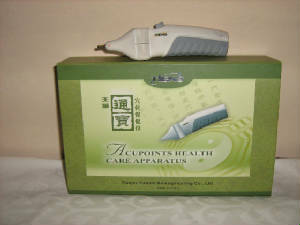 The Xuebao Acupointer produced by Tiens has its origins in ancient principle of therapy using acupuncture and moxibustion but it is more advantageous than traditional acupuncture and popularizes traditional acupuncture techniques by effectively avoiding the need to puncture the skin with needles practiced in traditional acupuncture which will cause fear of patients and undermine the treatment effectiveness. In addition, the traditional acupuncture can only be mastered and practiced by a trained Chinese physician. 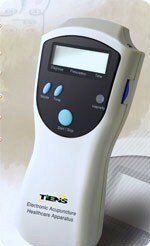 The Xuebao Acupointer carries on and promotes the theoretical essence of acupuncture treatment using Chinese acupuncture, giving full play of the effectiveness of acupuncture in modern treatment and healthcare in a unique and simple way. Xuebao acupuncture pointer is highly effective pocket-sized therapeutical acupuncture equipment made with state-of-the-art technology. 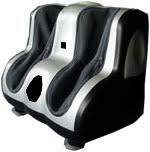 It has the effects of dredging the meridians and activating the collaterals and promoting microcirculation. The first of its kind and a leading similar product in China and the world, it has been called the Green Therapy. This patented (China State Patent No: 97103246.7) equipment produces fast and remarkable effects, easy to use, safe and reliable, without any side effects. Xuebao is a 3-in-1 apparatus based on research on the spoon needle therapy of the Nine-Needle Method of ancient China and incorporates modern high energy magnetic beam and electrical pulses. When its magnetic head is pressed against an acupoint, the focused high energy magnetic beam works on the acupoint of the human body through the skin and exert a fixed quantum of electric pulses by scanning the acupoint, thereby dredging the meridians and collaterals, regulating the functions of qi and blood of the meridians, collaterals and zang-fu organs in additions to expediting the microcirculation of the focus of diseases, regulating the irregular biological electrical field and magnetic field to achieve the effects of prevention of diseases and health preservation. Xuebao is a highly effective and ideal healthcare product for everyone all over the world and truly a "treasure" in your daily life. With Xuebao, you too can be a healthcare expert. Modern science and technology has directly or indirectly revealed the existence of a weak magnetic field around our body and the living environment. For instance, the beating of the heart, nervous activities, blinking of the eyes, and the muscle movements of our limbs can produce an extremely weak heart magnetic, brain magnetic field, eye magnetic field and muscular magnetic field respectively. Studies have shown that the human body is inseparable from magnet. The changes in the earth's magnetic field have significant impact on our bodily magnet and growth as well as development. For example, in the African nation Rwanda which has the strongest magnetic field in the world, men are much taller than their European counterparts. In the Pakistani region of Hunza, centenarians are common and most local residents are healthy. Investigations revealed that due to the unique geological features, the water supply is magnetized naturally. Magnetic deficiency can lead to a variety of diseases such as vegetative neurosis, premature ageing of cells, thick blood, clogging of blood vessels by deposits, cardiovascular and cerebrovascular diseases. In modern days, the earth's magnetic field is being blocked or hindered by skyscrapers, steel towers, bridges and other man-made structures. In addition, motor vehicles, electrical wires and cables, piping also block the natural magnetic field. Piped water has lost the magnetic properties of natural water source. People now are seldom exposed to the natural magnetic field. Mineral contents in food are reducing, resulting in a corresponding decrease of magnetized substances in the human body. Research also shows that the earth's magnetic field is weakening at an annual rate of 0.05%. Hence, it is necessary to replenish the magnetic loss of our body to ensure health. How to replenish the magnetic content in our body? · Often drink magnetized water to magnetize our cells. · Increasing the intake of fruits and vegetables planted in soil will directly helps the intake of natural minerals. · Position one's body in line with the North-South direction of the earth's magnetic field during sleep will help orderize cell of the organ and avoid a chaotic state of the cells. · Use of magnetic therapeutic devices, such as Xuebao Acupointer for pressing acupoints to achieve magnetic ordering of the meridians and collaterals of the body. Electrical pulses are the rapid changes of voltage and current in a given time. The electrical pulses of Xuebao Acupointer have a unique wave pattern produced by stepped-up and filtered voltage caused by coil high-speed cutting magnetic flux. This unique electrical pulses wave pattern can only be transmitted along the course of meridians and collaterals of the human body, thereby achieving the optimal effects in unclogging meridians and collaterals, regulating qi and blood. Clinical observations have shown that the therapy of stimulating acupoints with electrical pulses can achieve better results in most cases and has a certain degree of influence on blood biology with a marked increase in the 5-HT and 5-HIAA content (See article by Anqing Municipal Chinese Medical Hospital, Anhui Province). When Baihui acupoint (DU20) is stimulated with electrical pulses, it will have significant two-way regulating effect on the CAMP and CCMP in the plasma and normalize heart rate after exercise by 50% faster and expedite the speed of exercise by 3-5%. Hence, the stimulation of acupoints by electric pulses can produce multiple effects simultaneously and when technique of touching acupoints magnetic beams is combined with electric pulses, it can promote the interchange of magnetic field and bioelectrical field, producing current which can instantly free the meridians and collaterals for optimal treatment results. a. Raw materials: Xuebao is made of permanent high-energy magnet which is rare element and not ordinary magnet. The magnet flux formed by advanced technological method is magnetic beams and not magnetic field. b. Therapeutic effects: Acupoints are depressions located in the deep layer of periosteum. The magnetic beams formed by Xuebao's magnetic flux can reach the acupoints through the skin without piercing it. c. Scope of effects: Xuebao can interchange freely between static magnetism and dynamic magnetism. It is highly versatile, convenient and produces no side effects. d. Uniqueness of electric pulses method: The electric pulses produced by the magnetic head of Xuebao at a distance of 1mm from the skin can effectively penetrate the skin to reach the acupoints, meridians and collaterals. 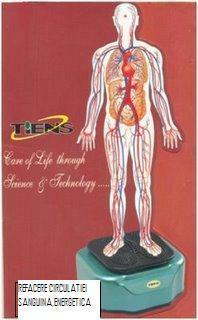 Usually, therapeutic effects can be achieved with only one or two electric pulses. It has high voltage, small current (uA class), does not harm the nerves or skin. It is scientifically designed for safety. · No electrical source or battery is required, versatile, handy. · No piercing of skin, cross infection or fear of using. · Wide range of treatment with instant effects of efficacy ad high as 98.4%. · Easy to use and can be mastered by everyone. An ideal pocket-size therapeutic device for the family. · No side effects, safe and reliable, a truly modern green acupuncture. 1. Touch and press method: Also called Needle-Lifting method (one of the Nine Needling methods of ancient acupuncture). It is practiced by strongly pressing the magnetic needle (head) of the Acupointer on the acupoint or the affected spot with up and down movements without detaching the magnetic needle from the skin. 2. Rubbing method: Also called the Scanning Method. It is practiced by touching the magnetic needle (head) on the acupoint or affected spot with clockwise or anticlockwise rubbing movements. 3. Electric pulses shooting method: To use this method, first connect the conducting rod and Xuebao Acupointer and touch the patient's skin with the conducting rod, when shooting the electric pulses, the magnetic head should be kept 1mm from the skin before pressing the switch at the lower end of Xuebao once or twice. 4. Static method: This method is used for certain constraints of acupoints or conditions of patient. When use, press the head of the Acupointer on the acupoint (e.g. Jingming BL1) statically with consistent strength without moving the Acupointer. 5. Scratching method: To use this method, just scratch along or against the affected spot or acupoint of the patient with magnetic needle (head) of the Acupointer. 6. Floating method: To use this method, move the magnetic needle (head) of the Acupointer up and down with a distance of 1mm from the affected spot (wound, skin ulcer). 1. Keep the Acupointer away from magnetic field, such as hand phone, magnetic cards, watch and TV. 2. Do not place the Acupointer in high temperature or damp place. 3. Do not press the switch of the Acupointer when not using electric pulses to ensure longer lifespan of the device. 4. Avoid dropping, pressing or shaking the device violently. Read the product manual carefully before use. 5. 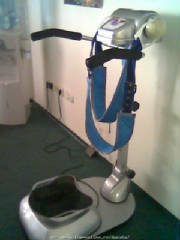 Not using device on patients with heart pacer, bone fracture, screws on fractured bone, expectant mothers, infants, proplapse of lumbar intervertebral disc, or serious necrosis of cuboids bone.